Leaving your consulting business to spend time with your family or friends in some other part of the world seems an inconceivable idea, most especially if you are the type who worries about their business constantly. Learn how to be able to do just that. 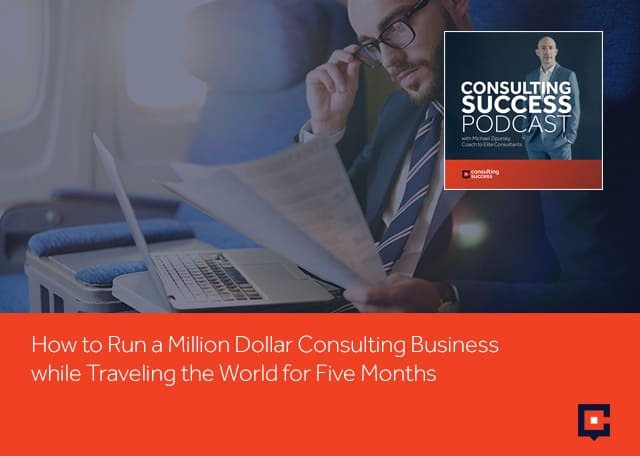 Michael shares how he managed to run his million-dollar consulting business while traveling the world for five months. He lays down his approach and shares how to generate a significant income, be a consultant, and realize your full and true potential while still having plenty of freedom and time to do anything you want. I’m going to be sharing with you and I’m excited to take you through this. This is my approach and our approach as a company to how we’ve been able to run a seven-figure consulting business while traveling the world for a few months. I spent a few months with my family traveling the world and living in different places from Spain and Portugal to Japan and Tel Aviv and Germany; a whole bunch of wonderful places. Even as I was traveling the world with my family, the business was still running. The business was still growing. There were consistency and predictability to what was happening. It doesn’t mean it’s always every single day a straight line, but things still were making progress. That’s what it’s all about. What I wanted to do in this episode is simply to share with you how I was able to do that. The approaches that you can take that could also benefit your business if you’d like to run a business like this. If you’d like to be able to generate a significant income, be a consultant or realize their full and true potential. Yet still, have plenty of freedom and time to travel or spend with loved ones or do anything that you want. The first thing that is important if you want to be able to run a seven-figure consulting business while traveling the world. Number one is a simple business model. In our business, we have two to three main offerings. We have books that I’ve written, but we have a coaching program for consultants who want to grow their business. 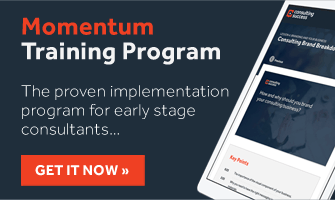 We also have an online course for consultants who are early stage. That is the core of our business model. The consultants we work with and that we support and that we’ve seen who have created the greatest and highest level of success in their businesses have done this as well. This is one of the things that we work with our clients on in the coaching programs are on productization of your consulting services. It’s focusing on how do you take all of your different skills and experience and expertise and start to package it and position it and place value on it. Create efficiencies and systems and processes that allow you to run it in a smooth way. Here’s the key, a simple business model. 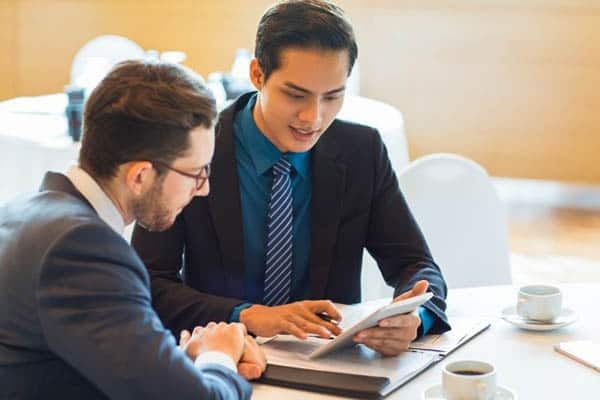 You don’t need more than two or three service offerings or product offerings to run a seven-figure consulting business. Having a few keeps it very simple. I’ve seen, I’ve witnessed, I’ve observed too many consultants who try and have ten different service offerings or fifteen different things. They’re trying all things for all different kinds of people and end up drowning in complexity. If you want to be able to run a successful consulting business and have a lot of freedom, the first thing that’s important is a simple business model. I know a lot of people think that addition is the way to grow a business, but subtraction is much more powerful. You don’t need to always add more and more in order to grow. When you strip away the inefficiencies, remove what isn’t going to help you then you are left with the essential. You’re left with the most powerful. You’re left with what is going to move things forward for you. That’s what you want. The second part of being able to run a successful consulting business and have a lot of freedom is team and support. In our case, we have Vincent who manages our technology. We have Savo who does content and marketing support. Sam who does a lot of program and client management and enrollment. We also have success coaches who are successful consultants themselves who run successful businesses and they support our clients as part of the work that we do. We work with a whole host of different contractors and experts in different areas that support our business. That’s important because if I try to do everything myself, even if just Sam and I tried to do everything ourselves, we would have a lot of trouble. We wouldn’t be able to get everything done or we’d end up working way more hours than we want to. In my case, that would mean I wouldn’t have time to spend with my wife or daughter. That’s not what I want. I want to be able to spend a lot of time with them. I want to be able to travel with them. I want to be able to spend time with my parents while they’re still around. I want to be able to spend time with other loved ones who I care about and to do things that are meaningful and important for me. Having a team and building a support network is important. I do want to say something about this, which is a lot of consultants who reach out to us don’t necessarily want to have a big team. Some do some no. “Yes, I want to have four or five, maybe up to ten associates or consultants and I want to build a firm,” but others want to keep things lean. They’ve come from the corporate world. They’ve been managing big teams and they don’t want to do that anymore. They want to run lean and efficient. You don’t need to build a big team. You certainly don’t need to hire a lot of full-time people and have employees that you need to manage. What I would highly recommend is that you start off becoming clear on what areas of the activities of your consulting business are lower value tasks or are things that you yourself aren’t that good at and someone else can help you with. Start to put those contractors, start to put those people into your team but they’re not full-time employees. They don’t need to be right away necessarily. That way you can test what is working. You can start to build better systems and processes around that. You don’t need to have the expense or the stress or the worry of adding on a lot of additional resources and infrastructure and cost into your business right away. 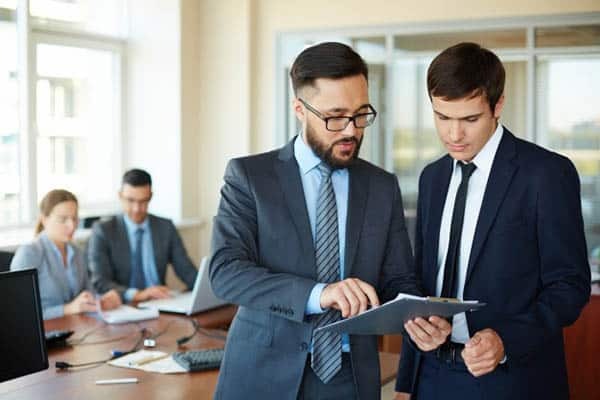 That is key for many consultants and it’s certainly the approach that we’ve taken in our own business and in many of the consulting businesses that we’ve had over the years. I’ve been building consulting businesses for many years and we’ve been working directly with consultants for several years. I’ve seen how a lot of different approaches can play out, the positives and negatives of each. When someone is looking to build a team, in my observation and experience, the best way to do that is to start by placing some contractors and people into your team. You can build those systems and processes. Then as it becomes clear that you need someone more full-time, then you’re going to be able to do that. Your real focus at the early stages should be on winning business and having conversations with ideal clients. You don’t want to get distracted right away by thinking about having to manage a whole bunch of people. Process and systems are the third key to making this all work. I’ve alluded to this. I mentioned processes and systems several times already, but let me go a little bit deeper and detailed on this. What we’ve done in our business is we have a process on how we onboard new clients. We have certain messages that go to them. We have certain actions that need to take place, certain things that get sent to them. All of this is already defined. It’s decided upon and it’s structured. It’s part of our process. We have a system for it. The same for scheduling calls. When someone wants to speak with our company about one of our coaching programs or working together, whatever it might be. We have a way that we manage our calendars and we make that efficient for both the client and also for us. That’s important because then we’re not having to go back and forth emails all the time to try and arrive at a time that works. We’re using systems, we’re using technology and we’re using processes. Another example of this is how we go about doing podcasts and videos. We ran an event in Toronto for our elite level of clients. These are the consultants that we work with who are doing anywhere from $500,000 to over $1 million per year as consultants. Many of them have either small teams and there are a few even that are solo. They’re running at a high margin, profitable and seeing a lot of success in their business. We were sitting down for dinner one night and I was sharing some of this with one of our clients, Rob. He said to me, “Michael, I never knew that. That’s interesting.” What I’m going to share with you, I never thought too much about it. It’s something that we’ve put into place. It was an eye-opener for him. I shared it with other clients at the event and everyone appreciates it. I want to also share this with you because it’s going to be a benefit. The way that we approach both doing podcasts and videos is that I do a little bit of the work. What I mean by that is we run a podcast for quite some time years ago. We put it on pause because we had different priorities. We decided that we wanted to come back to it years later because we saw the benefit of it and I enjoyed doing. I love interviewing and talking with other people and most of all, I love being able to bring additional value and to share for you, for the community of consultants here. In doing that or in deciding to do that, the one requirement that I had was if we’re going to bring the podcast back, I want to just show up. I want to do the interview and I want to step back. That’s it. I don’t want to be involved in anything else. I don’t want to be involved in scheduling the podcasts. I don’t want to be involved in editing it and so on. What we did is we’ve built a team. We’ve connected with contractors and different service providers that help us with the podcast. Whether it is going out and finding additional guests, even though we have a lot of people that reach out and want to be on the podcast. We use the services of a company that also helps us to find people to create more predictability and consistency so that we don’t find that we’re missing a slot or something like that. If you yourself are a consultant and you’re earning already over $300,000 per year and you would like to come onto the podcast and share some of your experience of how you built your business. Certainly, reach out and let us know. We’d be happy to speak with you about that. That’s one thing. The other is editing. We also use the services of a company that does all of our editings and creates the graphics and posts the podcast to our site and puts up the transcript. All I need to do is show up. It’s already on my calendar, a booking comes in automatically. I jump on the podcast. I interview the person and simply upload the file. In some cases, I don’t even need to do that and that’s it. That’s efficient. With video, it’s similar. I go into the video studio and I record typically a whole bunch of videos at once and then I step back. All I need to do is send those videos to our editor. She will take care of those videos and she will upload them to YouTube. She will make them available to us for sharing on social channels and on our website. We have someone that also manages the social part of things. The majority is not full-time people because we don’t need them full time, but they play an important role in making sure this stuff gets done consistently. That allows me to be focused on where I can create the greatest value, which is working directly with our clients, writing books, creating new content and training. Doing different studies and accumulating best practices that I share with our clients. That is what I want to be focused on. If I try to do everything, it would mean less time on all of those things, but it would also mean less time to spend with my family or traveling. That’s important for me and it’s worked out really well. The other thing is that in the systems and processes, there are a few things that are constant in my calendar. For example, there are a few things like I have a call at a certain time every single week with some clients. I have certain calls with other people on our team certain times of the week that’s scheduled and doesn’t change. Aside from that, my calendar is quite fluid and open and it’s flexible because I’ve set it up that way. I’ve created structure. I’ve set it up so that I can take a certain number of calls each day, but then I want to leave time each day to work on priorities. The fourth key to all of this and to making this work and that allowed me to travel a lot. Continue to and to still run a successful consulting business is what I would say prioritize. That’s the key. What I always do is I focus on the biggest priorities and I get them done first. Every single day when I come into the office or if I’m somewhere on the coast of Spain, it doesn’t matter where I am in the world. The first thing that I will do is I will look, “What are the priorities for now?” The priorities are the most valuable and meaningful work. I want to get clear on what are the most valuable work and most meaningful work that I can do. Not just now but over the next period of time, that’s going to help myself and the company reach the goals that we’ve decided upon that are meaningful and valuable. I’m able to look at that list consistently. This is not a to-do list of daily stuff. These are the real key priorities for the quarter or for the next month or whatever that might be. I’m looking at that list and then I’m able to go into it daily and say, “This is what I’m going to be working on now.” In many cases, it’s already decided in advance. I have that list and I reference it on a daily basis. It’s always focused on priority work. What that does is it keeps me from finding myself going down a little rabbit hole of, “I’m able to search for some new information or maybe I’ll try and learn about some new technology.” These are all things that maybe I’d like to do and could be fun. I could fool myself into thinking that I’m being productive. The reality is that I wouldn’t be. I wouldn’t be making progress because I wouldn’t be focusing on the priorities. I’d be spending time on things that are a lower value and most likely are distractions. The other point here that I want to share with you around prioritization is that I have been trying to and this is not just connected to being able to travel for five months out of the year. It’s important for running the business is avoiding starting your day with email. I still find myself sometimes doing this, but I’ve become much more cognizant of it. I try not to start my day with email because what I’ve found is that if I start my day with email, I end up spending a lot of time going through it and dealing with it. It’s not the best use of my time. A much better approach is the first thing I do is I look at my priorities. I have a pad of paper or an actual book that I write out my to-dos. I look at my calendar online. I organize the day and I make sure that I’m going to be spending time on priorities. In addition to that, closing tabs to your email. You don’t need any notification from your email or to see that you have a new email. Close all that stuff. Turn off Skype or put Skype to do not disturb or anything else that could get your attention, your phone as well. That will help you to get a lot more done. The next point is around sacrifices. This is important to share with you because there are many gurus out there online who paint a rosy picture and try and position like, “Everything’s fantastic and terrific all the time. There are no real big challenges. Look how successful I am.” I haven’t found that to be the case. In anything that we do in life, there are always going to be positives but there are also going to be some negatives. There’s going to be some downside. There are going to be some things that maybe aren’t rosy and 100% filled with joy, but it’s okay as long as the stuff that is filled with joy is the vast majority. I want to share with you some of the sacrifices that I’ve had to make in order to run a seven-figure consulting business while traveling the world for five months. One is doing what I need to do to show up. As an example, when we were in Spain for a few weeks, I would run certain calls because they’re set in the calendar. I would be running them at 10:00 PM. Typically, I wouldn’t be working at 10:00 PM, but I was in Spain and that was the time zone that made sense in order for me to do this call as I always do it. That’s what I was prepared to do. When I was in Japan and when I continued to go to Japan, I will be up at 5:00 AM taking calls sometimes because that’s what I need to do. That’s what’s required. That means that I may not be able to go out one night with people who I’d love to go out with. It might mean that I can’t sleep in or I can’t go for those drinks or whatever it might be. If these are little sacrifices that are part of my life and part of what I’ve chosen to do because it’s a small little inconvenience for such a great benefit in return that I get. The other thing too is that there’ll be times where I will be somewhere and it might feel like, “This is a holiday. I’m in Tel Aviv. My family’s going to the beach and they’re going to be playing, but I’m in the apartment. I’m in the tower that we rented and I can see the ocean and it’s beautiful. I can imagine my family playing on the beach and I could be there with them.” What I have to remember is that I also need to get some stuff done. It’s these kinds of balances where for some people it might be hard. At times for me, it’s like, “Maybe I should push this off and do it later.” I also know that in order for me to be able to continue creating the kinds of results that we’re seeing for our clients and for ourselves, it requires that I have a good work ethic. What that does mean as well is that I’ll work hard to get stuff done. When I’m done, then I’m all good to play and I can make time to spend with my family and do whatever it is that we want to do. The other area that I want to share here with you is important in order to achieve everything that I’ve put forth here and offered as my own experience is making decisions. I believe that in order to achieve real significant growth in your business. In order to achieve the lifestyle you truly want. To have the freedom, to have the flexibility. To have the ability to travel, to have the ability to spend a lot of time with your kids and loved ones. You have to make decisions and you have to get clear on what you want. That’s what I did. I got clear on what I wanted. That also means that you need to become committed and not just interested. There’s a big difference between people who are committed and people that are interested. If you’re interested, it means that you might to read about going somewhere. You might get all excited. You might even plan about the vision that you have for your business, but when it comes down to it, you don’t take action. You take action and it doesn’t work all the way that you want and you give up right away. You say that you want to do something, but you don’t do it. People that are committed when they decide they’re going to do something, they do it. They make it happen. It doesn’t mean it’s a straight line all the time. It doesn’t mean it’s always easy, but they keep going and do whatever they need to do. Get whatever help they need to get to achieve what they want. The other thing that I want to share with you that has been important for me is thinking and playing big. It takes us almost the same amount of work to play small as it does big, yet the results that you can get are significantly greater. That means your fees. The type of clients you want to have. How much you want to grow. The type of lifestyle you want to have. You can create whatever you want as long as you’re committed to doing it and committed to taking the action and making the investments. Have time, resources, money, all that stuff to get you to where you want to go to. I’ve always found that it takes pretty much the same amount of time to get a smaller result as it does a bigger result. The energy, the effort, the fear is almost the same. Why not play a lot bigger? Why not go for what you want? The other point is to stay away from complexity. There are so much noise and hype in the marketplace. There are many people making these wild claims and telling you that you can do all these different things. I’m sick of it. I’ve found that even for myself, over the years what I’ve done is I’ve unsubscribed from many newsletters. I’ve stopped taking a lot of different information in. I still take information in. I still invest in coaches. I still invest in mentors. I still attend certain events or training or whatever it might be, but I’m selective because I want to move away from all the hype and the complexity and the noise. Instead, I want to focus and be clear on what is meaningful. What is going to get me to where I want to go and where we want to go as a company? By doing that, it’s allowed us to say no to a lot of things that look interesting. We get approached all the time. Do I get contacted all the time by people who say, “Do you want to partner with us on this? Do you want to do this? Do you want to promote our product?” I often say no, not because it’s not a good idea, not because I don’t believe that we couldn’t generate significant additional revenue from it but it’s not all about revenue. It’s not all about making more money. It’s also about having and doing meaningful work and creating memories and spending time with loved ones and living the life that you want. You can’t do all those things if you’ve created all this complexity and said yes to everything. Being able to say no by being clear on what you want, I’ve found to be a guiding principle. Those are the principles that have allowed us as a company and me sharing this myself now to live the life that I want. That allowed my family and me to travel for five months while still running a successful consulting business. I believe that for you, by following these principles, that you can create a highly profitable business that provides you as well with lots of freedom to be with family and loved ones. To travel, to work from anywhere that you want and ultimately, to have the lifestyle and business that is the one that you desire. Hopefully, you’ve found these principles to be helpful. If you have any questions about them, please reach out. Let me know. Post into the comments section on the podcast page. If you enjoy this, I would love a rating and review, if you haven’t already. Thank you for your continued support and being part of this community. It means a lot to us.